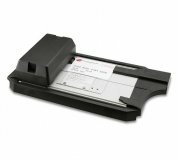 The Addressograph Bartizan flatbed 4850 is ideal for businesses looking for an affordable, reliable imprinter for credit card transactions. It provides accurate credit card information for chargeback protection and backup, at a highly competitive price. The combination of reliability and low price makes the 4850 the most robust cost-effective imprinter available. Its low flex base won't bow or bend like other low cost alternatives. Dimensions:	H 2 5/8" x W 5 7/8" x L 11 1/2"
Sales Slips: Provision is made to hold both 51 and 80 column sales slips. Merchant Plates: Most industry standard plates can be accommodated. Our standard imprinters are set-up for use with an embossed plate of .014 - .016 over material height. Provision can be made for non-standard plates and forms.